The GAMSAT September 2019 sitting will be held on Wednesday 11 September 2019. For a list of test centres where the test is offered in September 2019, please go to Test centres. Registrations for the September 2019 sitting will open in mid May 2019. 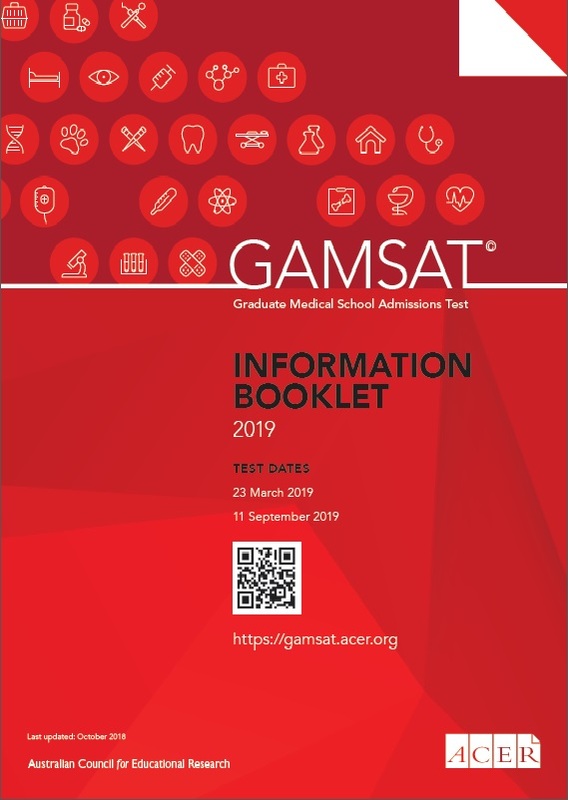 Before registering candidates must read the GAMSAT Information Booklet. The fee to sit GAMSAT in September 2019 is $505 (including GST) in Australia, €335 in Ireland or £262 in the UK. The registration fee includes a copy of the online Practice Questions e-book. Registrations close at 1pm British Summer Time (BST) or 10pm Australian Eastern Standard Time (AEST) on Monday 22 July 2019. Late registrations are accepted until 1pm British Summer Time (BST) or 10pm Australian Eastern Standard Time (AEST) on Thursday 1 August 2019. An additional late fee of $100 (including GST) in Australia, €70 in Ireland or £60 in the UK applies for late registrations. All fees will be charged in Australian Dollars for candidates sitting GAMSAT outside of Ireland and the UK. Under no circumstances further registrations will be accepted after 1pm British Summer Time (BST) or 10pm Australian Eastern Standard Time (AEST) Thursday 1 August 2019. Payment must be submitted online by credit card (MasterCard, Visa). The online payment option operates through ACER's e-commerce facility via the ACER website. Credit card details are not recorded or stored by ACER but are encrypted at point of capture and transmitted directly to the bank, without entering ACER information systems. Candidates will receive a payment confirmation/tax invoice by email once the payment transaction is completed. The credit card statement may list ACER as the recipient, and a specific reference to GAMSAT may not be mentioned. If the amount charged to the credit card provided to complete the registration is wrongfully disputed, the registration may be cancelled, results may be withheld or the candidate may be blocked from taking further ACER administered tests.